We made Christmas trees out of different shapes for a craft/learning activity. First I cut out 3 of each shape in different sizes: Triangles, Circles, Squares, Diamonds, Ovals, Rectangles. Then I let LM glue them on the paper from biggest to smallest. We added star stickers on top and a brown tree trunk on the bottom. what a great idea! I will defintly be making these for my daycare kids to play with at the feltboard! tahnks for sharing!!! 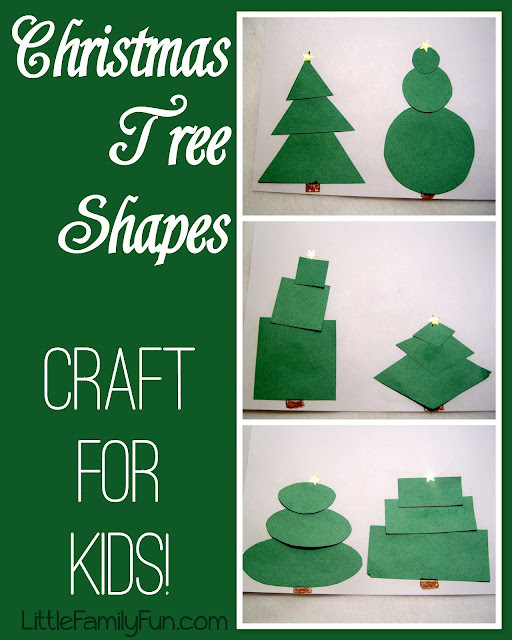 We loved these shape Christmas trees and featured them at our blog, Preschool Lesson Plans! We were sure to give idea/photo credit, as well as a link back to your blog, but we'd love for you to take a look. If there are any problems, we'll be sure to take the feature down immediately!